With all of the other meets going on this summer, the Jr. Nationals are a touch more lightly attended than theyhave been in the past. 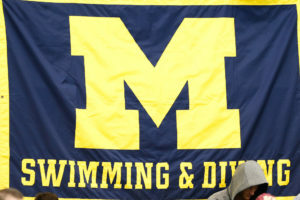 Mostly, the meet is for 18 & under swimmers who aren’t quite top-5 swimmers on the senior level yet, so your Missy Franklins and Liz Peltons and David Nolans all stayed home. But these Jr. Nats are still a great way to pick out some of the rising young superstars of USA Swimming, especially those who are in a bit younger (15-16) of a range. It’s also a great opportunity for some of the more age-group oriented programs to earn recognition, because during senior nationals these age group programs, regardless of how strongly they develop swimmers, are usually drowned out by the Tucson Fords and SwimMAC’s of the world. This women’s 200 fly was a gangbuster of a race, with the top four swimmers all finishing within three-tenths of each other. Headed into the final 50, Courtney Weaver of Flint YMCA (Michigan) was about two strokes behind the other three top finishers, but she roared home with a great closing 50 of sub-34, the only swimmer in the field to do so. Being able to close a 200 fly that fast is impressive at any level, senior or junior, and her finishing time of 2:11.52 is great for a 15-year old. That would have placed her 8th at senior nationals. In 2nd was Kara Kopcso out of Franco’s Fins Swimming in coastal Louisiana, who held on for silver in a touch of 2:11.72. Celina Li of Pleasanton and Madison Wright of Kingfish were chasing Kopcso down on the last 50 as well, but just ran out of real estate and tied for 3rd in 2:11.77. Clark Smith, a 16-year old from the Denver Swim Academy, made a touch of history with his win in the 200 fly in 1:59.33. That made him only the 5th American to ever clear the two-minute mark as a 16-year old. 18-year old Alejandro Cisneros of Mission Viejo took 2nd in 2:00.78, and Jimmy Yoder, a 15-year old from Stingray swimming in Georgia, took 3rd in 2:01.12. Yoder previously tore up the Athens Sectional meet a few weeks ago, and he apparently still had plenty more to give based on his early performances here. He’s a monster of a 15-year old that will be one of the top recruits out of high school in a few years. Emma Schoettmer of Center Grove Aquatics was the real star on day 1 of this meet. The 17-year old played this meet like a pro, in making a huge drop from prelims to finals, and broke the meet record in 2:27.99. That easily cleared the old record of 2:28.70 set by WUG’er Andrea Kropp at last year’s meet, and would have placed Schoettmer in the top cluster of 2:27’s that led senior nationals. In 2nd was Kaylin Moss (16) of New Canaan YMCA, followed by Maija Roses (15), a SwimMAC junior, in 2:32.04. Annie Zhu of Asphalt Green was 4th in 2:32.58, though she’s been much faster this year. William Licon was the top finisher in the 200 breaststroke in 2:16.09. Though that time is slower than the winning time we’ve seen the past two years, if you compare it to any meet pre-2009 it would be a record. That shows you how far junior swimming in general, and this meet specifically, has come in this country even over the past few seasons. His program, Nitro Swimming in Austin, is rapidly becoming one of the top age-group programs in the country. Gunnar Bentz of the Dynamo Swim Club finished 2nd in 2:17.22, followed by Charles Katis from Curl Burke (1:17.33). Amongst the other finalists in this race was 15-year old Peter Kropp of the Rattler Swim Club. Kropp is the younger-brother of Andrea Kropp, who we mentioned above as being the former meet-record holder in the women’s version of this same race. 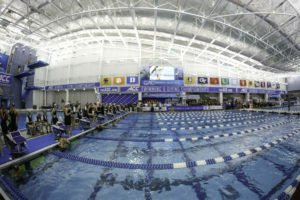 The youngest winner on day 1 was 14-year old Kathleen Ledecky of Curl Burke, located in the DC area, in 8:36.05, which just missed Lauren Driscoll’s meet record. While still a ways off of Cynthia Woodhead’s NAG Record set back in the 80’s, Ledecky’s swim is the fastest swim we’ve seen by a 14-year old in at least the last 15 years. Megan Rankin, who last week placed 9th at senior nationals, managed to drop another second off this week to take 2nd in 8:39.19. She was able to close with Ledecky, but didn’t have the same opening speed as Ledecky did. Danielle Valley from the Sarasota YMCA in Florida finished 3rd in 8:44.49. It’s no surprise that, even at the junior level, the top two finishers in this men’s 1500 were from the Mission Viejo Nadadores. That program has an unbelievable history of producing distance swimmers (and swimmers of all likes) including Cynthia Woodhead, Chloe Sutton, Larsen Jensen, and Chad La Tourette. The next two swimmers to climb that latter are Jandardan Burns (15:34.36) and Logan Redondo (15:37.74), who at 15 and 17 took the gold and silver in this race. Burns’ times at this age are actually very comparable to those of another former Nadador, Fran Crippen. Full day 1 results from Junior Nationals available here. The meet is on the same schedule as Sr. Nationals were last week: 9 AM West Coast start for prelims and a 6PM West Coast start for finals. It’s incredible how deep US swimming is. Really, the results from this meet are unbelievable. 159 girls under 1:00 in the 100 free is just beautiful.